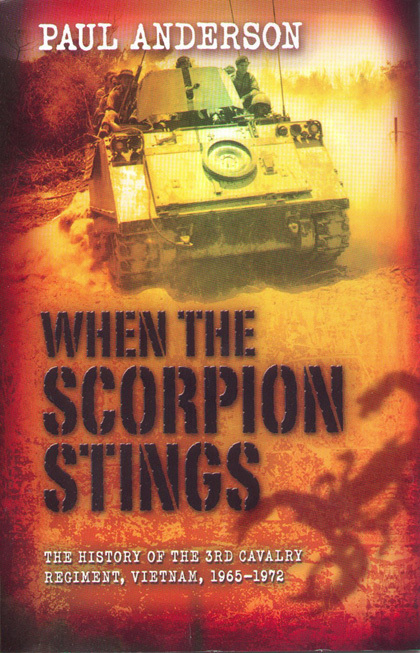 The Written History of the 3rd Cavalry Regiment - "When the Scorpion Stings"
Paul Anderson passed away on the 29:10:2001, but his book "When the Scorpion Stings" is now in production and was launched on the 27th April 2002 in Fremantle by Kim Beazley. The book can be obtain at any good book shop as Dallas Burrage has sold the last from the Fremantle 2002 Reunion launch. The Regiment was the first unit involved in the establishment of the Australian Task Force at Nui Dat and the last to leave when the Task Force was finally disbanded. The versatility of the Armoured Personal Carrier allowed the Regiment to function in dual operational roles: firstly as cavalry, and secondly as Armoured transport support. In this way the unit became known as the workhorse of the Australian Task Force, with its daily routine constantly changing and virtually impossible to pin down. The unit's small size, yet extremely dangerous capabilities in action are reflected in the regimental emblem - a Scorpion. The Regiment participated in many of the major battle of the Viet Nam campaign, including Long Tan in 1966, and often played a key role in the outcome. However, until now its unique achievements have all too often been lost within the larger accounts of the various infantry battalions to which the Regiment was attached. For the first time, this account documents the role of the 3rd Cavalry Regiment - one of the most decorated Australian units that served in Viet Nam - and the lives of the men who served within it.